Colorado Coffinmaker had the most liked content! Hi again Brazos, Way back in the Wabac (Sherman and the Perfesser) the Eastern and Central "Flyways" were plagued by "Market Hunters." The "Flyways" are the routes the migratory water fowl use for their Winter and Spring migration. Market Hunters would shoot anywhere from 250 to 500 birds a day and then sell them to various "markets" much like Chickens are. The practice also gave rise to the "Punt Gun" which was an enormous shot gun with about a 2 inch bore. The gun was attached to a small boat, called a "Punt" (hence the name) and was used to ground sluce entire flocks of birds resting on the ponds and streams. The practice of Market Hunting (slaughter, really) very nearly wiped out the populations of migrating Ducks and Geese. The near loss of those wild fowl resources are why we now have bag limits and repeating shotguns are limited to two rounds in magazine. ALL repeating shotguns in this country are required to have plugs in the magazine, reducing capacity to two. Getting caught with an un-plug'd magazine in most jurisdictions will result in loss of license, loss of gun, and a hefty fine. I would have a couple of suggestions. First would be to drop your powder charge to 20 - 25Gr, made up the rest with Cream-0-Wheat, change to a 160 - 180Gr bullet. Next would be to reduce your cartridge case size, either to 45 Schofield or Cowboy 45 Special. Also, 2f will give slightly less felt recoil. Cowboy 45 Special will be problematic in Rifles. 45 Schofield will run in a Toggle Link rifle with a 200Gr RNFP. NOTHING shorter. Triple 7 makes a marvelous garden fertilizer. Black MZ and APP are very nice BP Substitutes. C45S cases can be used in Toggle rifles with a custom carrier. Tyrel's answer confused even me (ain't that hard). DR, you brother has opposing cross draw holsters. Can't do that gunfighter. There are however, a whole pile of shooters who switch the cross draw holsters. 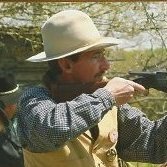 Switching them side for side gives the holsters a muzzle forward cant and aids in a smooth(er) draw when the holsters are moved toward the front center of the belt. Basically, the holsters go on the gun belt backwards. Unless your brother has already had lots and lots of practice with his off hand, I do NOT recommend he start out with Gunfighter. The initial outcome will not be harmonious. Hi Brazos. The 87 and 97 were designed and built for Market hunters. Nothing at all to do with "cowboys." 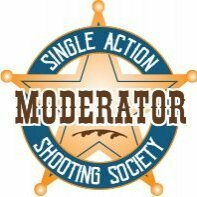 As has been mentioned, the original rule for NOT stoking the 97 was done to eliminate the perceived advantage over SxS shotguns. Probably a 1/4 pound jewelers hammer. Won't be able to do much with it though. Looks like a Model T with an extended pick-up bed. The cab, with the exception of the "optional" canvas top is "open." Fun in the rain I bet. Yepper. And then some poor sod picks it up and re-broadcasts the tripe as if it were gospel. Other miscreants then pick it up and use it to incite mayhem. What a crock.